It’s never too soon to start thinking about money, and more importantly, your own personal finances. But the financial world is huge, and it can be overwhelming to know where to start. To make it a little easier, we’ve compiled a checklist that every twenty-something should be able to use. There are some money matters that, if you take care of them before you turn 25, will make the years ahead a whole lot easier when it comes to building your wealth and upping your net worth. 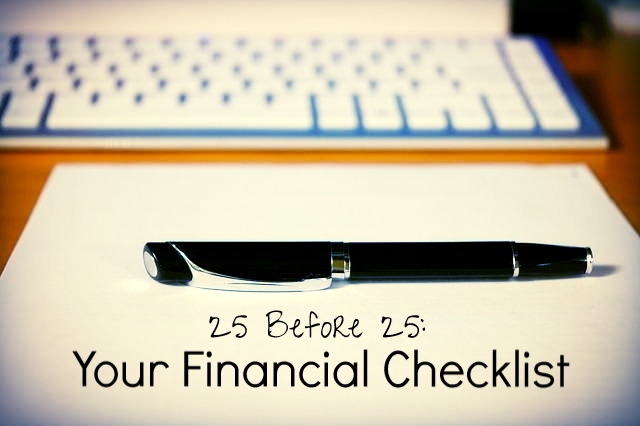 So use this financial checklist of 25 things to take care of before you turn 25 to guide you and help you get it together when it comes to your money. They’re not. They are a line of credit. If you don’t have $500 in your checking account, you cannot afford to put a $500 purchase on your credit card, no matter what the limit is. Even if it’s just $20 per month, make sure you’re contributing to some sort of investment account. No-load funds with Vanguard are a smart way to go, because your returns won’t be eaten away by fees. Saving for retirement is so important – and it’s so much easier if you start saving, even if it’s just a little bit each month, before you even turn 25. It is never too early to invest, because time is the biggest advantage you have on your side. So as soon as you’re financially able, increase your contributions (instead of succumbing to lifestyle inflation). Compound interest is the best thing you can have working for you when it comes to building wealth. If you’re not convinced time really makes that much of a difference, check out the example at the end of this article that shows the effect time has on your nest egg. The biggie here is to make sure you’re enrolled in your employer-sponsored retirement plan if one is available to you, and contribute at least enough to get the match if one is offered (check out more places to hunt out free money here). It’s time to stop thinking you can YOLO your life away and use that mindset as an excuse to buy whatever you want. Embrace living well on less and kick your obsession with material possessions. Cut the cable, negotiate a more reasonable deal with your cell phone provider (or switch providers completely), ditch the gym membership and work out at home on your own or with the help of fitness videos like the ones at Fitness Blender. Think about other ways you pay for things that don’t actually provide any lasting value – and then drop them. Do you really need a $4 coffee drink before work every morning? Of course you don’t. That’s terrible for your wallet and your health, so knock it off. Speaking of your health, it’s time to start paying more attention to your physical fitness and well-being if you haven’t already. I hate to break it to you, but gone are the days where you can get away with eating a gazillion Pizza Rolls for dinner and avoiding any negative consequences. Make appointments with your health care providers. Exercise regularly. Eat real food. If you don’t, you’ll be paying for it later. Being unhealthy costs a lot of money. You need to have a little something tucked away, earmarked for unexpected expenses. Things happen all the time that are totally unforeseen – and expensive. How much you save up will depend on your individual situation, but a good rule of thumb is to sock away 3 to 6 months’ worth of living expenses. The point is to be prepared. Spiff happens. Even if you don’t care what your credit score is or don’t believe you need one to get by, everyone else in the financial world sure is interested to know what your numbers are. Your credit score is like your financial reputation, and financial institutions will use it to judge how much of a risk you are. Let’s back up a step here. No, you shouldn’t drive yourself into debt by abusing credit cards, but you do need to know that regardless of your personal thoughts on credit, the rest of the world uses it and expects you to have some yourself. If you fail to utilize credit as a tool, it will be hard for you to get excellent interest rates or loans when you need them. You might not even be able to rent an apartment or home if you can’t provide any credit history. Insurance is there for a reason: it allows you to prepare for the worst and it protects you and your stuff. Make sure you have the appropriate coverage in the areas that apply to you. Everyone should have health insurance (and most everyone, in the US, anyway, needs car insurance). If you rent, you need renter’s insurance while property owners need homeowner’s insurance. If you have family, you’ll want to look into term life insurance. It’s simple: spend less than what you make, and save more than what you spend. Knowing what you want to do – and how you want to make money – for the rest of your life is difficult to understand when you’re 18. But by the time you’re 25, you need to have goals and plot out actionable steps that you can take to reach those goals. If you are living on your own, with a full-time job – it’s time to stop accepting financial assistance from your parents. As you age, they do too, and they have their own retirement to start considering. Be respectful of that, grateful they helped you to this point, and take pride in your ability to pay your own bills (even if it means not getting to go out and spend your money on fun stuff instead). And even if you are living at home, try to do what you can to pull your weight. If you have a job, help pay the utility bills. If you’re unemployed, run errands for your parents, cook, or clean. Do something that shows appreciation and offers value to your family. You don’t have to give away all your hard-earned money, but you should start making it a habit to donate even just $10 per year to your favorite cause or charity. The act of donating money to a great cause is incredibly rewarding, and even if you don’t have any money to spare, there are a plethora of charities that accept material donations. You can even donate your boat to charity. Boat donation is a surprisingly simple process. Just do some quick tax paperwork and dedicate the proceeds to a number of great charities. You can use this donation as a tax write-off later on, making it a win-win situation for all involved. We’ve talked about having an emergency fund and saving for retirement – but that’s just the tip of the iceberg. Set savings goals for other important things in your life: traveling, purchasing your own place, making a major career change and moving across the country, etc. Experiencing and learning new things are always well worth the financial investment. Don’t hesitate to spend a bit of money on your education, either formal or worldly. Be open to new ideas and strive to be able to experience all the different, unique things that interest you. Don’t rely 100% on your employer to take care of you in the form of a regular paycheck. It’s never been easier to start up a side hustle and pick up some freelance work, either for people you know in the “real world” or virtually. Not to mention, striking out on your own and creating your own income – even if it’s just on the side – is incredibly empowering. Always look for fresh opportunities and with that extra money you make, contribute more to your retirement or save up for some of your other big goals. On a similar note, catch complacency in your career before you hit 25. It’s easier to make necessary – and sometimes scary and risky – changes when you’re younger. It’s okay to want to seek out a career that’s fulfilling, both personally and financially, but the older you get the harder it will be to change gears. If you’re not sure about something, ask! Some aspects of personal finance are straightforward, like living below your means. Other things, like taxes, get complicated really quickly. It’s okay if you still don’t know all the answers, as long as you’re always willing to admit when you need help and then to seek out someone who can provide that for you. Money is important. It provides a lot of needs and takes care of things that make life comfortable. But having a ton of money isn’t a requirement for living well. There’s nothing wrong with seeking out free or low cost events or taking advantage of discounts or coupons. You’ll only make yourself miserable if you constantly check to see how you measure up to other people. You will always be able to find someone that you feel has it better than you. But remember: someone else’s good fortune is not your bad luck. Practice gratitude and appreciate the things that are good and wonderful in your own life, and be happy for what you have instead of jealous over what you don’t. Because places like the county tag office usually don’t take credit cards, and you are going to look a real fool if you have to ask the nice lady behind the counter how you fill out your own checks. The Internet is an incredible resource and Google will pull up the answer to just about any question you may have. If you have something that needs fixing or you’re not sure how to do something on your own, your first action is not to hand it off to someone else to take care of for you at a cost. Research and see if you can’t learn something new (and save yourself some cash). Being frugal means that you practice mindful spending, and you strive to be less wasteful. You aim to do more with less and you require fewer resources to be happy. Being cheap is when you refuse to spend a dime to help others, or you berate a cashier for accidentally shorting you ten cents. Cheap is when you feed your pets the crappiest, most processed food that results in their ill health, and then you avoid taking them to the vet unless they’re actually dying. Cheap is neglecting to care for yourself, your home, or your family for the sake of saving a few pennies. Be frugal. Don’t be cheap. It’s always good to have a goal to work toward. Give your money – and the time you spend working for it – a purpose. And remember, seek a balance with your finances. Try to invest a dollar for every dollar you save, or for every month you met your savings goal, spend a little money to treat yourself. Hopefully we’ll all be living long, healthy lives, so we need to save for our futures – but there’s nothing wrong with living now, too. That’s a great list Kali! I will surely save this page to check on my progress. A great list for any age! I know plenty folks above the age of 25 who still need to work on a number of these things (myself included). Thanks Addison! I know it’s pretty ambitious to have all this stuff “checked off” by 25, but the earlier people start thinking about money and getting on the right track financially, the better off they’ll be! Haha. I’m with Addison — there’s a few of these I need to take care of soon, and I’m already older than 25. Great article, Kali. I’m at the stage of building and growing my career. I learned a lot of those financial lessons in my very early 20s, so I’m building upon them now. I only just finally started to grasp the concept of frugality (instead of being cheap). I’ve been practicing proper frugality for about a year now. A great checklist!